I occasionally like to marvel at how the face of knitting has changed. Do you remember how it was at the beginning of the internet? I remember the first issue of Knitty! I remember reading about this new sort of book, the Handbook, and how exciting it was to finally read it! And I remember fondly the trips on the bus out to This is Knit, when they were just a weekend shop in a little cabin out on the southside. They had wool, proper wool! And I think it’s funny how, in just a few years, blogs have gone from being a critical source of news and inspiration to, well, sort of prehistoric. There’s twitter, instagram, evil facebook… an endless plethora of methods to keep in touch and up to date. 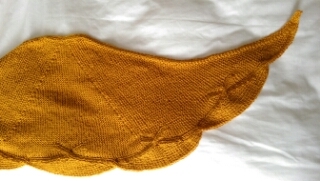 (Ravelry, obviously, goes without saying). Despite all of this, I doubt I will ever stop blogging. Naturally, I have slow times but it is rare that I miss a whole month without sharing something. I know that I have readers that come and go but I also know that a lot of you, even if you never comment, you still come back and check in. I appreciate that! 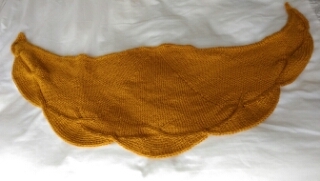 Aaaaaaanyway… all this to say that, even when I don’t share much knitting, there is always knitting. Ask Alb. He was once such a delicate sitter, always beware of what may lie beneath him. 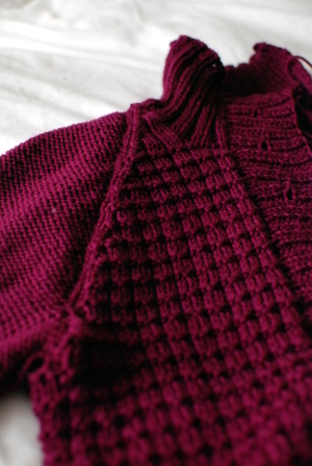 That didn’t last long – these days, it’s more caveat knitter. This is what I’ve been working on/pulling out from under Alb most recently. It’s an old Brooklyn Tweed-Wool People design called Tinder. I really like the Brooklyn Tweed patterns. 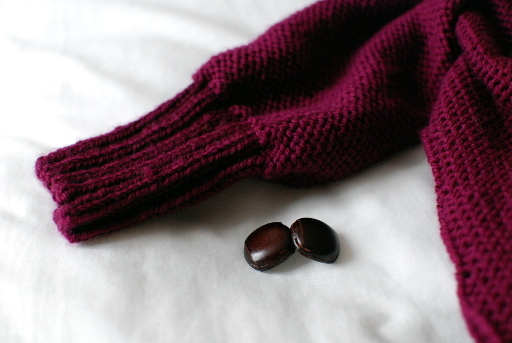 They’re well curated, well edited and tend to be reliable to knit from. 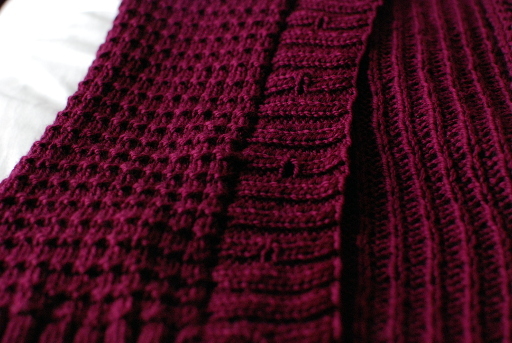 I’m using a yarn I bought a good while ago… maybe two years ago already… it’s the Rico Essentials Aran. I bought it the same time I bought the orange yarn for Chuck, with the intention of knitting this cardigan. It feels good to be finally getting down to it. 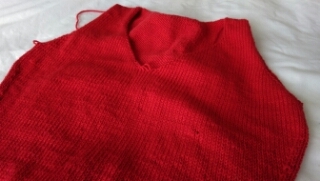 The sleeves are knit separately and you have to seam it up before you can knit the collar on. I stalled picking this back up after we got back from Japan (photos still being worked on and ARE forthcoming, I swear! Still so much to share! 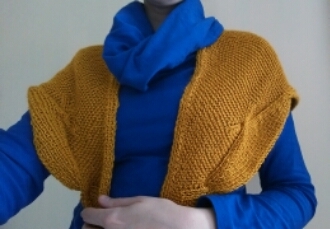 )… because I was convinced I still had another sleeve to knit. Turns out, it was all done already, so I got stuck in. Now I only have one more band to knit. By chance, I have the most perfect buttons in my stash. In the depths of winter, I had a yearning for a wool duffle coat. I bought some lovely navy wool melton, which is like a thick felted wool, and these buttons, with the idea of making a duffle. However, the more I thought about it, the more I realised that a duffle was not the right garment for such lovely fabric. 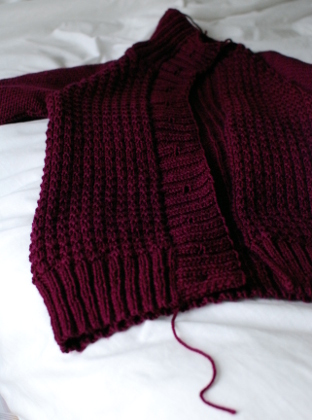 So I started a different design which, as it neared completion, warranted a very different button. Here I am with eight of these guys and I think they will be perfect.